Already a strong year for Jalapeno Records following the release of Soopasoul's 'Pushin Weight', Volume 2 of the label's 'Soul Sisters' compilation and Izo Fitzroy's 'Skyline' album, amongst several others, The Allergies breaks-filled dancefloor funk serves as a strong highlight for Jalapeno in 2017. DJ Moneyshot and Rackabeat - the Bristolian duo who comprise The Allergies - have brilliantly captured the essence of classic funk and soul records along with what everybody loved about 90s golden era hip-hop, repackaging it all for modern day consumption. Long-term friend and collaborator of the group, Andy Cooper, guests on several of the album's tracks providing a nice extension to their previous collaborations (be sure to check out Cooper guesting on The Allergies previous release , 'As We Do Our Thing', and The Allergies remix to Cooper's Bring It To Me' for more from their excellent chemistry); Dr Syntax also manages to jump on a track and shines on 'Remedy', while Canadian vocalist Honey Larochelle breathes incredible energy into album highlights 'Love That I'm In' and 'Entitled To That'. 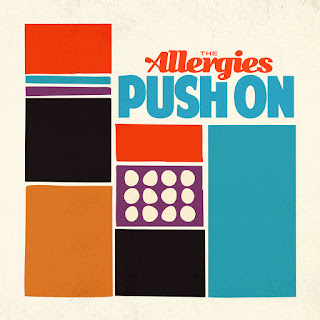 'Push On' is a solid release for fans of the hip-hop and breaks-inspired funk fusion which The Allergies have turned into an artform. Here's to looking forward to more from the group and to what else Jalapeno has up their sleeve for the remainder of 2017.